Jean Knight Says. . .
New information I've acquired leads me to finally get around to re-writing this post. 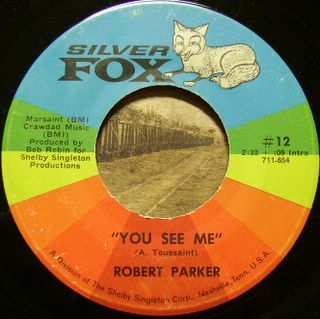 I previous assumed, as had some others, that Parker recorded this single, issued by Shelby Shingleton's Nashville-based Silver Fox label, in New Orleans through Allen Toussaint and Marshall Sehorn's Tou-Sea/Sansu Prodcutions and that it ended up on the label through a deal made via DJ and fellow record label owner, Bob Robin. What threw me off was the fact that Toussaint wrote "You See Me" and the arrangement sounded like one of his. But things wend down differently. It turns out that Robin, as the record label so states, actually did produce this single himself along with another by Parker The sessions were done in Muscle Shoals rather than Nola, as I found out from Neil Pellegrin's highly informative notes to the Soul-tay-Shus/Tuff City CD compilation, The Best of International City, which features tracks produced by Robin, who owned the International City and River City labels in New Orleans. The Parker sides did not appear first on either of Robin's labels, but were leased directly to Singleton, who issued "You See Me" / "You Shakin' things Up" on Silver Fox and "The Hiccup" / "Rockin' Pneumonia" on SSS International (#819). As those CD notes further state, Robin had heard a version of "You See Me" that Toussaint recorded with Willie West supposedly on vocal [Note: Willie West just told me that he did not cut it. He's not familiar with the song at all. So, as I suspected, Robin meant to say Willie Harper, who did do an unreleased version, available on the Sundazed Get Low Down CD compilation]. When Sehorn delayed releasing the song, Robin somehow got a copy and took it to Muscle Shoals with Parker and had the in-house band (the Swampers?) reproduce the arrangement. That's why it has that extra Toussaint touch. Parker had not recorded for several years, since his previous label, Nola Records, went bust as part of the Dover Records distributorship collapse that pretty much closed down the recording scene in New Orleans for several years, wiping out numerous small local labels. Neither of his Singleton-released singles gained any traction, and the singer would not record again until the mid-1970s when he did sign with Sansu and recorded three funky singles issued by Island. When I hear this song, I always think of The Band, as Parker’s vocal sounds somewhat similar to Levon Helm; and the track has that roots rock/R&B feel the group, who were coming on strong in 1969, could do so well. It’s no surprise that the boys in The Band soon asked Toussaint to do the horn arrangemens for several of their recordings. Whether its Band feel was a conscious decision on Toussaint’s part, “You See Me’ is a great record from the era that deserved more than the obscurity to which it was quickly relegated. hope all goes along OK (your moving). Nice to see Robert Parker again on your blog. I first really became aware of Toussaint when the Band brought him to NYC to work on horn arrangements for their ROCK OF AGES live dbl, released around 71 or 72 I think. Maybe he also did same for the Last Waltz--I've got it in several forms, but I'm not sure. Not a big thing either way--great Parker track! and film for horn arrangements. I know he is credited on Rhino's 4 CD 'Last Waltz' set from 2002, 'cause I'm lookin' at it. The thing is, he only worked on about half a dozen of the songs. The rest of the charts were done by others. Thanks. Not super important or anything but does anyone know if Silver Fox Records had anything at all to do with Charlie Rich (who's nickname was "The Silver Fox")? He (Charlie that is) recorded for Sun which was eventually bought by Shelby Singleton. Like I said, I'm more curious than anything else...killer little tune BTW...thanks for another 2.75 minutes of heaven. Well, Dirt, I'm getting out of my element when discussing Charlie Rich, although I am a fan of his early Sun stuff, having heard it on the radio in Memphis as a kid. He was a great musician with jazz and R&B leanings that his later career in country music pretty much totally obscured. He also lived in Memphis later in his life and made a nice record of jazz influenced standards with some jazzbo musician friends of mine back in the 1980's or early 1990's. But, as usual, I digress. . . I don't think Shelby Singleton's Silver Fox label had anything to do with Rich. SF was one of Singleton's offshoot labels (another was Blue Fox) from his SSS International outfit. Allmusic says he bought the Sun imprint from Sam Phillips (no relation to me, sorry to say) in 1969. Rich left Sun in 1964. But, I did see in Allmusic that, when Singleton was running Smash Records in the mid-1960's, he recorded some singles on Rich. So, there are several connections, at least. I haven't researched how far back Rich's 'Silver Fox' nickname goes. So, I'll leave that path open to you. Glad you enjoyed the tune; and thanks for sharing your curiosity. It's part of what this site is about. I believe all of those "Fox" labels (Silver Fox, Blue Fox, House of the Fox), had something to do with Lelan Rogers (formerly of International Artists and brother of the dreaded Kenny). And how could I have left out House of the Fox, Larry? Thanks for reminding me and for the info on Mr. Rogers of the Fox neighborhood.